My new book, A History of America in 100 Maps, has been featured in a variety of media outlets recently. In November I had the opportunity to work with HistoryHit, one of England’s most popular history shows led by Dan Snow. The results are both a video and a podcast showcasing some of the ideas and content from the book. The book was also recently reviewed in The Economist, and appeared in the magazine’s year-end roundup of best books of 2018. And for an in-depth discussion of the book, check out this interview I did with Utah Public Radio in early December. Strikingly, reviewers, interviewers, and readers have all expressed strong interest in the deerskin map featured in the book. It was made in about 1720 by a Cherokee leader for the new governor of the South Carolina colony. The map was a tool of trade and diplomacy, an instrument that reflects the highly fluid relationships and power dynamics in the aftermath of the Yamassee War. I think what intrigues readers most about the artifact is the way that it “maps” power in terms of relationships rather than absolute space. As you can see below, the tribes of the Southeast are represented by circles that indicate their relative size and power, and their connection to both the other tribes and the colonies of South Carolina and Virginia. You can read more about the map in chapter three of the book. 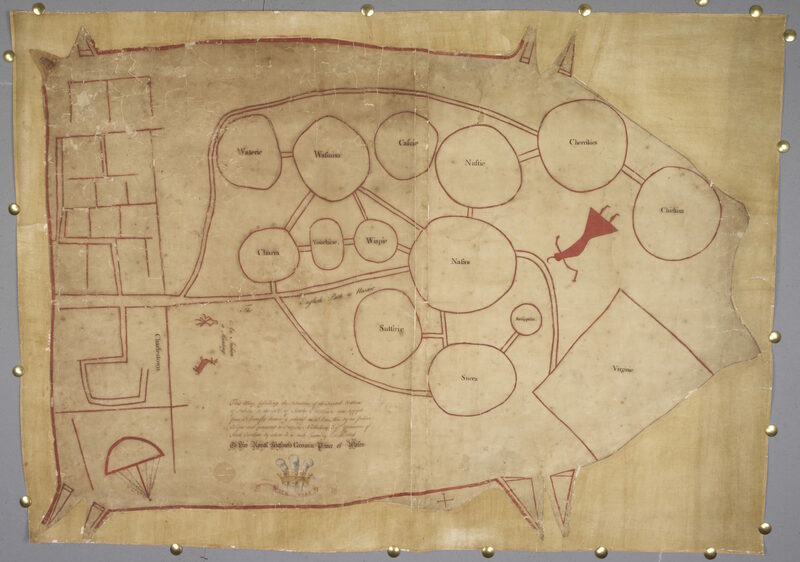 An indigenous view of the deerskin trade, made about 1720. Click to open in new window.